Scientists using NASA’s Curiosity Mars rover are eyeing a rock layer surrounding the base of a small butte, called “Mount Remarkable,” as a target for investigating with tools on the rover’s robotic arm. The butte stands about 16 feet (5 meters) high. Curiosity’s science team refers to the rock layer surrounding the base of Mount Remarkable as the “middle unit” because its location is intermediate between rocks that form buttes in the area and lower-lying rocks that show a pattern of striations. Depending on what the mission scientists learn from a close-up look at the rock and identification of chemical elements in it, a site on this middle unit may become the third rock that Curiosity samples with its drill. The rover carries laboratory instruments to analyze rock powder collected by the drill. The mission’s first two drilled samples, in an area called Yellowknife Bay near Curiosity’s landing site, yielded evidence last year for an ancient lakebed environment with available energy and ingredients favorable for microbial life. The rover’s current location, where multiple types of rocks are exposed close together, is called “the Kimberley.” Here and, later, at outcrops on the slope of Mount Sharp inside Gale Crater, researchers plan to use Curiosity’s science instruments to learn more about habitable past conditions and environmental changes. 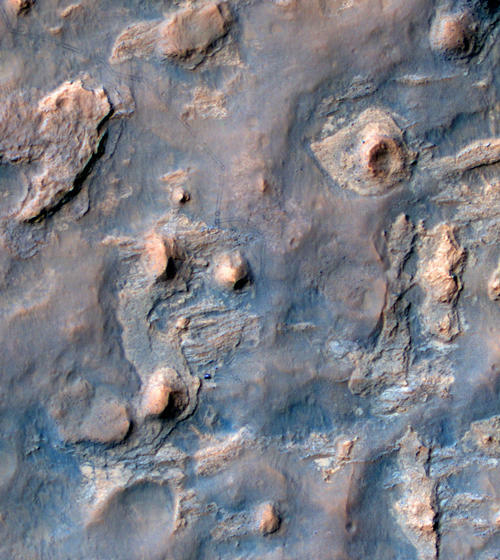 NASA’s Curiosity Mars rover and tracks from its driving are visible in this view from orbit, acquired on April 11, 2014, by the High Resolution Imaging Science Experiment (HiRISE) camera on NASA’s Mars Reconnaissance Orbiter. Image Credit: NASA/JPL-Caltech/Univ. of Arizona. This entry was posted in Mission News and tagged Curiosity, HiRISE, Mars, Mars Reconnaissance Orbiter, Mars Science Laboratory, mission, NASA, rover, spacecraft on 2014-04-18 by Heather Dalton.